The Earth is made of rocks and this poster provides a comprehensive overview of what they are and how they are formed. It begins by explaining that rocks are made of minerals and that each type of rock is the result of a specific mixture of minerals subjected to a clearly defined geological process. The bulk of the poster is divided into three sections, one for each type of rock: igneous, sedimentary and metamorphic. An illustration shows how they are made. It is followed by photographs of a dozen representational specimens. A dramatic photograph shows a natural formation. A bonus section shows and explains some of the more specialized and popular rock forms such as geodes, concretions, agates and thunder balls. 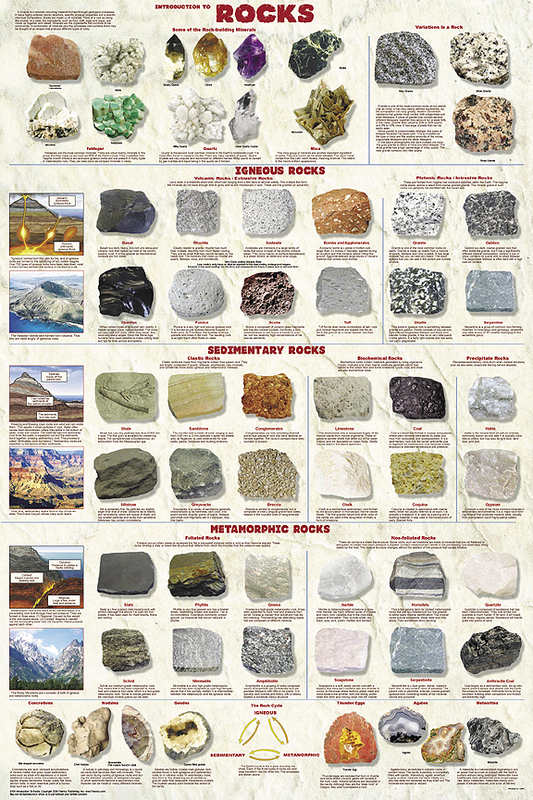 This is a great poster for earth science classes, but one also appreciated by rock collectors as it is a helpful resource for identification. Standard poster is large 24" x 36" size that fits standard frames. Printed on heavy, acid-free paper using non-fade inks, then coated to provide satin finish and provide protection from scratching. Laminated poster is standard poster encapsulated in 3 mil plastic.